Colored and underlined text indicates new features only available in the upcoming release of the application currently in review by Apple on the iPhone AppStore — some of the screen shots might also reflect the new version and be slightly different from the version currently available for download. Place calls using your Google Voice number rather than your mobile number — enter numbers directly, select a contact from your device's contacts, or call back any number in your history. The application can seamlessly handle multiple Google Voice accounts; calls can be placed using call back, direct call, or offline dialing (automatic fallback with no data connection) — see below for an explanation of the supported calling modes. Send and receive text messages (SMS) from your Google Voice number — including support for long messages exceeding 160 characters, sending to multiple recipients at once, and support for non-English messages. SMS composed with no active internet connection can be queued for automatic sending the next time the application detects a working internet connection while active. Send and receive picture messages (MMS) and playback incoming audio and video attachments. Please note that MMS support requires activation via a one-time In-App Purchase. 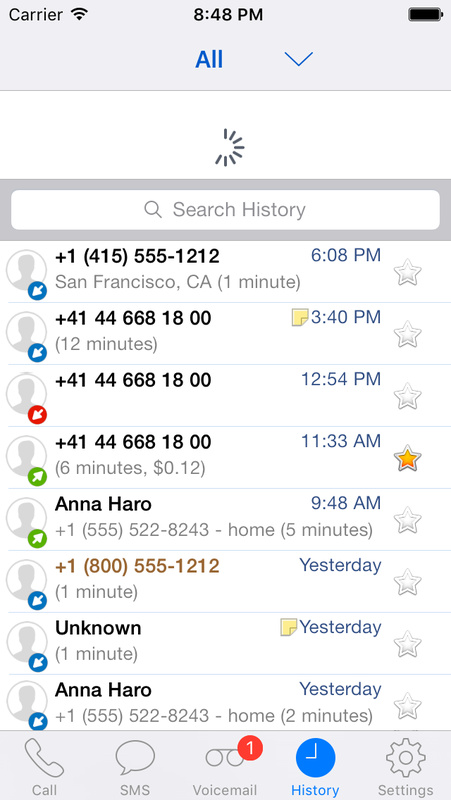 Automatically check for new SMS and voicemails - even when the application is in the background. Listen to voicemails and recorded conversations right on your device (allowing you to pause, rewind, or fast forward to any point within the message) — voicemails will also show the transcription of the message when available. Mark messages as starred or un-/read, attach notes to conversations, block/unblock senders, un-/archive, trash or delete conversations. Easily search in your history by contact, message, or note content – supports continuing searches online for messages that have not yet been cached locally. All messages (including voicemails) are stored on your device for convenient offline access. Composing notes and text messages can be done in landscape mode. 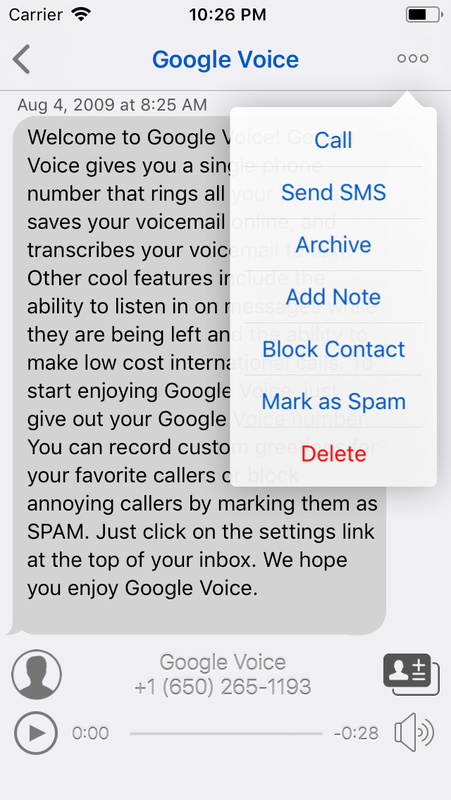 Quickly change various Google Voice account settings (call/SMS forwarding, do-not-disturb — including the option to have DND automatically expire at a specified time, message notifications, …) and add additional calling credit to your account directly from within the application. Quick Settings allow saving and restoring complete account settings (DND, forwarding, …) for easy switching between different profiles. Automatic selection of Quick Settings based on current location (available as In-App Purchase on supported devices). Supports gesture navigation when typing text for easier placement of the cursor: swipe left/right with one or two fingers to move the caret position backwards/forward by character or word. Swipe left/right with three fingers to go to the beginning/end of the existing text. Supports TextExpander touch snippet expansion. All communication is done with the Google Voice website directly, no need to hand over your account information to a third-party. Please note that GV Connect is not a SIP/VoIP application and will thus not allow making calls from an iPad or iPod Touch without a separate VoIP/SIP application. GV Connect currently does not support answering a call back to your 'Google Talk' callback number directly on the device — see VoIP Calling for current solution that allow making and receiving calls using data only. GV Connect stores your account password securely in your device's keychain for faster login when launching the application — communication is done via secure connections (SSL) to the Google Voice servers and no contact information (other than the contact's phone number which is required to place a call or send a message) is sent to Google. All operations are fully synchronized with your Google Voice account. GV Connect is available on the iPhone App Store (requires iOS 9.0 or higher and an existing full Google Voice account including GV phone number). Macintosh users please also check out the free GV Connect Dashboard Widget (requires MacOS X 10.7 or higher). The individual screens of the application are detailed to the left - click the "Next >" button or the screen shot itself to go the the next screen shot. While most screen shots show the iPhone/iPod Touch interface, behavior on the iPad is the same - see the last image for a screen shot of the iPad interface. By default, the call history only shows calls. 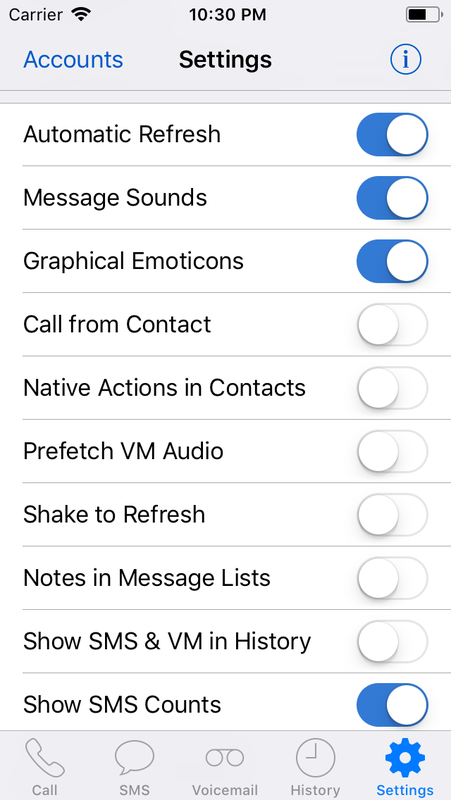 You can change it to also display SMS conversations and Voicemails by toggling an option in the Settings view. • Tap & hold any conversation in the list to bring up additional options (mark as un-/read, un-/archive, block sender, forward as email, …). On devices supporting "Force Touch", press firmly to peek into the conversation and swipe up during the peek to reveal those actions. • Tap the reply field at the bottom of the conversation to type and send a reply to the current conversation. The reply field will show a character counter to show the number of characters (or number of SMS the message will be broken into). You can also double-tap anywhere in the previous conversation to show the keyboard and start typing a reply. • Tap the camera icon to attach an image (selecting from your existing images or taking a new image with the camera) to the message (note: sending images requires purchase of the MMS In-App feature). Attached images will display as small thumbnails below the reply field – tapping a preview image will remove the image from the message to be sent. The first entry in the settings allows access to "Quick Settings" — you can create named Settings (using the current settings for forwarding, DND, notifications, … for the current account) or quickly change all settings to a previously saved state by selecting an existing Quick Setting. If the current account settings match one or more of the Quick Settings defined for the currently selected account, the name of the matching Quick Setting will be shown. In the Quick Settings view, swipe to delete or rename any of the existing Quick Settings. When selecting "Edit" in the list of Quick Settings, the settings comprising each Quick Setting can be inspected or changed and a new Quick Setting can be created. If you enable "Location Awareness" in the "Quick Settings" list, you can assign a location to each of your Quick Settings. Upon reaching that location, the application will automatically change your account settings to match the settings for that Quick Setting (even when the application is in the background). Additionally, you can denote one of your Quick Settings as the "Default" settings which will be enabled upon leaving any of the locations attached to other Quick Settings. You can choose to get a notification every time Location Awareness changes your settings. Location Awareness is available as an optional In-App Purchase on supported devices – this feature requires region monitoring which is only supported on the iPhone 4 and above, iPad 2 (3G), and iPad 3 and above. • En-/disable Email notifications for incoming voicemails, SMS, or missed calls to the address indicated — if you have more than one Email address registered on your Google account you can select which one the notifications should be forwarded to by selecting the Email address. • En-/disable automatic prefetching of audio files for voicemails – if pre-fetching is off, audio files will be downloaded the first time you listen to a VM (and cached on the device after that for faster access later); with pre-fetching on, the audio files will be downloaded and cached on the device automatically when a new voicemail is received (note that enabling pre-fetching can potentially increase your data usage charges). • The dial pad to place calls is presented in a popover (from the little phone icon at the top left of the interface) and is accessible regardless of the current context. • The 'Accounts' and new SMS compose buttons are accessible at all times regardless of the selected view - this allows to quickly switch between accounts while staying within the current view. • The username and GV phone number of the current account are always visible below the application icon on the left - this allows to quickly identify which account is active if more than one account is set up. • Unread SMS conversations and voicemails are indicated with a red indicator next to the entry in the list on the left. What are all the calling options supported in GV Connect and how do they work? Callback: when placing a call, you will receive a call from your own Google Voice number to the selected callback number (shown in the "Call" button on the keypad or in the "Start Calls From" section in the Settings tab). Just answer the incoming call and you will be automatically connected to the number you are calling. Note that selecting your iPhone's number as the callback number might use calling minutes from your cell phone plan — if your cell phone account supports unlimited calling to a list of numbers, you might be able to add your own Google Voice number to your list of preferred numbers to avoid depleting your monthly minutes when using your Google Voice number. 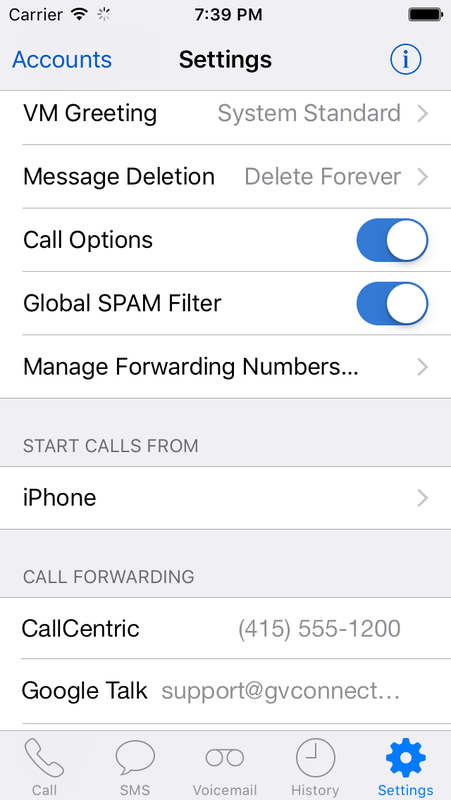 Direct Call (iPhone only): after selecting "Direct Call" as the "Start Calls From" setting in the application, calls will be made by calling a temporary Google access number which will directly connect to the number you wish to call. Please note that this access number is temporary only — if you try to redial it form the iPhone's recent call list you will hear a recorded "cannot complete your call" message. Also note that the access number is assigned by Google on a per-call basis – GV Connect has no control over what access number is used to place the call. In order to direct calling to work, your iPhone's number needs to be added as a "mobile" forwarding number to your Google Voice account. Using direct call might use calling minutes from your cell phone plan. 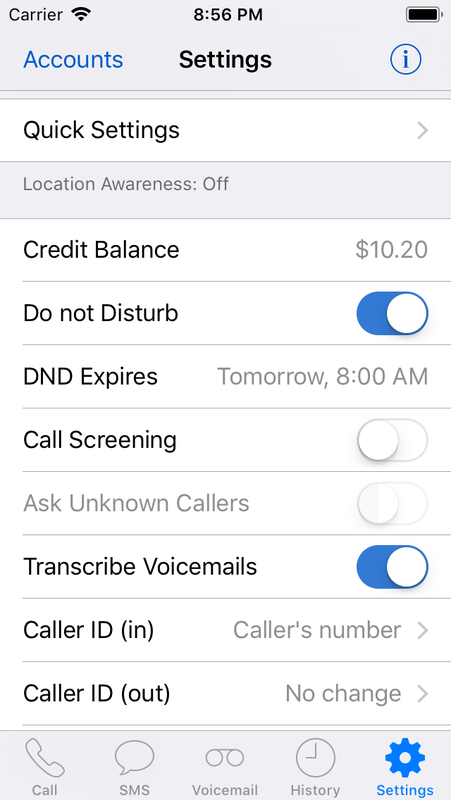 iPhone Dialer (iPhone only): calls will be placed through the iPhone's native phone application, using your iPhone's phone number as the Caller ID. This allows for faster connection of calls, requires no data connection, and can be especially useful if you use your provider's Google Voice integration for your iPhone's number (e.g., with Sprint as the provider). Please note that this option might use calling minutes from your cell phone plan and could potentially incur large calling costs with your carrier – especially if you are placing international calls. Offline Dialing (iPhone only): using any of the above calling methods (other than "iPhone Dialer") on an iPhone when data access is currently unavailable, you will be asked whether you want to place the call in "offline mode" — this will call your own Google Voice number and then automatically dial through the voice prompts to connect you to the number you wish to dial. This option requires that your iPhone has been added as a "mobile" forwarding number to your Google Voice account and that you set up your iPhone on the Google Voice website to directly connect to your voicemail (Settings → Phones → click the "Edit" button below your iPhone's number → "Show advanced settings" → "Direct access to voicemail when calling your Google number from this phone?" set to "Yes"). Note that placing a call using offline dialing is rather slow (typically 30+ seconds until the target number is called) and that it might use calling minutes from your cell phone plan. The application badge shows the total number of unread items (SMS and Voicemails) in your account. The badge numbers for the individual items inside the application show only the number of unread items that are available locally on your device. Most likely you have older unread items in your account that are not available locally on your device - you can search for all unread items (and mark them as read as required) by entering "is:unread" (without the quotes) in the search field on the GV website when visiting it with a desktop browser. To mark all those messages as read without having to do so manually in badges you could also try to use this script. To answer the 'Google Talk' callback you need to answer the callback from a Desktop browser while logged in to your GMail account. In order to answer calls from your device without any third-party applications you need to select your mobile number to start calls from (or an SIP number connected to your GV number and answer the incoming call from a separate SIP application). I receive an 'Invalid Number' error message for every number I try to call — I'm sure that the number is correct! If you still get the error with numbers entered in on of the above formats, make sure that you have a GV phone number (and are able to use Google Voice outside the GMail web client) and have at least one actual phone number defined as a forwarding number on your Google Voice account on the website and select that number in the "Start calls from" setting — if your only number connected to your Google Voice number is your 'Google Talk' account you will get the 'Invalid Number' error. Your username and password are stored securely in your device's Keychain. In order to ensure that Keychain data is well protected, there are several security checks performed by the system — if any of these fail, the password cannot be stored, resulting in you having to re-enter it the next time the application is launched. If you encounter this issue, please make sure that your device is running the latest system software and that no custom modifications have been done on any of the system files as those might result in failure to properly access the Keychain. I don't have a Google Voice account — do I get one when buying GV Connect? No — an existing full Google Voice account (including GV phone number) is required in order to use GV Connect. If you don't have an account already, you can request an invitation for a new account (currently available to US residents only). - From the Call window, click your current account balance and select "History" or "Add credit"
Can I access my Google/Google Voice contacts from within GV Connect? Yes — if you set up your Google account using the Exchange protocol (see these instructions on how to do this), all your Google/Google Voice contacts will be accessible from within your device's Contacts application and thus be available to GV Connect (and all other applications as well). Does GV Connect support Push Notifications for new messages? Not at this moment — see the section about Push Notifications below for current solutions. However, the application will check for new messages in the background and present a notification in the notification center - selecting this notification will open the application directly to the new message. How will I get charged for calls and SMS when using GV Connect? Sending and receiving text messages using your Google Voice number are free (data charges might apply). Note that Google Voice currently does not support international SMS. When making calls with your Google Voice number using your iPhone, normal calling charges (based on calling your own Google Voice number) apply. For international outgoing calls placed from your Google Voice number, international calling rates apply (charges will be deducted from your Google Voice account balance) — calling is available worldwide. Since all the data accessed by GV Connect is located on Google's servers, there is currently no way to provide push notifications unless you would be willing to either store your Google Voice account information on a third-party server (which would essentially give that party full control of your account) or forward all your SMS and VM notification emails to a third-party email address. As GV Connect currently communicates with Google's servers only, your account information is safe and well protected. Providing push notifications directly within GV Connect would require setup of an additional account on my server in order to be able to redirect the push notifications correctly — this makes the separation between credentials and user data much less clear and would require a large amount of trust on the side of the user. The application will check for new messages in the background and present a notification in the notification center - selecting this notification will open the application directly to the new message. This requires that "Automatic Refresh" is enabled in the Settings view, that "Background App Refresh" is enabled in "Settings → General," and that it is enabled for GV Connect in the list of allowed applications. NOTE: if you manually force-close an application from the application switcher, background fetching will no longer work for that application until it is manually re-launched. Don't kill GV Connect from the application switcher or background fetching of new messages will cease to work. GV Connect Dashboard Widget (MacOS X 10.7 or higher) + Prowl: use the generic "GV Connect" redirection in Prowl for the application name "GV Connect"
This solution works if you have access to a Mac that is connected to the internet at all times and it does not require passing your notification mails to a third party. However, the GV Connect Widget currently does not distinguish between new SMS and new VM in the notification title so you can't set up more detailed redirection settings in Prowl to directly open the application to a specific tab. Also, as the fasted polling interval in the Dashboard widget is one minute, notification can be delayed up to a maximum of one minute. Use the official Google Voice app: while Google's own application is severely limited in its features, you can enable its notifications to receive Push notifications without requiring to involve any other third party to do so. After receiving a Push notification from Google you would then have to manually open GV Connect to see the new message. gvconnect://call? [NUMBER] (where "[NUMBER]" is replaced by a phone number) – launch the application to the dial pad with the specified number entered; simply press "Call" to start the call. Use "FAVORITES" (without quotes) in place of "[NUMBER]" to open to your in-app favorites list in order to select one of your favorites to call. 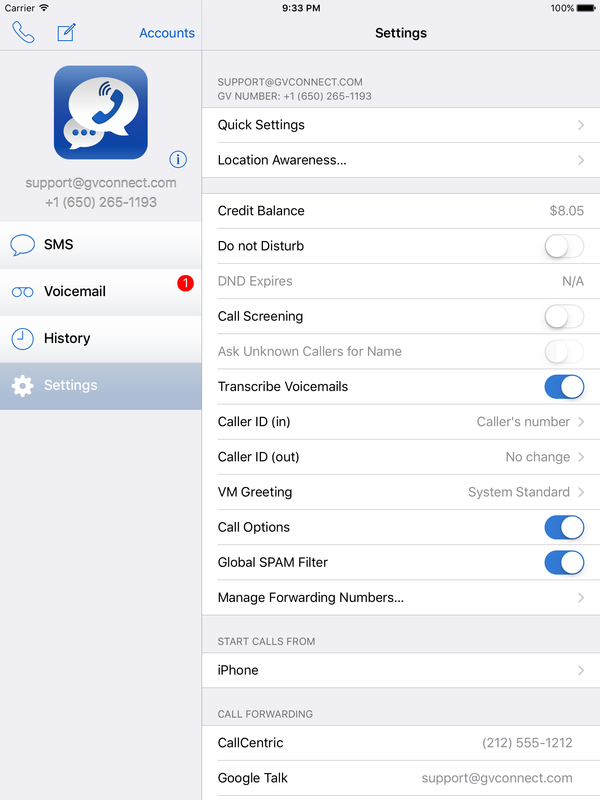 gvconnect://call?number=[NUMBER]&callmethod=[CALLMETHOD] (where "[NUMBER]" is replaced by the phone number to be called and "[CALLMETHOD]" is replaced by the calling method to be used — use either the forwarding phone's name or phone number or use "DirectCall" to use the direct call method on the iPhone) – launch the application and initiate a call to the specified number using the specified calling method. Use "FAVORITES" (without quotes) in place of "[NUMBER]" to open to your in-app favorites list in order to select one of your favorites to call. gvconnect://sms? [NUMBER] (where "[NUMBER]" is replaced by a phone number) – launch the application to a new SMS compose window with the specified number as the recipient (enter up to five numbers, separated by commas, to compose a group SMS). Use an SIP client (e.g., Groundwire or Softphone) on your device to set up your CALLCentric account. If you know of other applications that can interface with GV Connect please let me know and I'll add them to the list. Various stability improvements based on user-submitted reports. Fix crash introduced in the previous version that would occur when editing an existing QuickSetting for accounts with at least one linked number on devices where the Location Awareness IAP is available. Add (SMS-only) support for accounts without linked numbers - Settings are now accessible and the accounts are properly saved. Change "Forwarding Phones" to "Linked Numbers" to match the new nomenclature used on the Google Voice website. Various stability improvements based on user submitted reports. Fix crash introduced in the last version that could occur for messages with multiple attachments. Playback support for audio and video attachments in MMS messages (requires MMS In-App Purchase). Complete overhaul of the login process. This should provide much better stability against future changes on the server side and now also supports 2-Factor Authentication via the "Google Prompt" method. Fix "unknown error" when adding a new forwarding number. Fully support the latest devices and screen sizes. Improvements to login process when additional information (e.g., captcha, email verification) is required to complete. Improvements for grouped notifications on iOS 12. Add full support for the latest phones. Work around an issue where the in-line SMS reply field would not properly expand its size when using Siri dictation. Fix some display issues that could appear when first showing the actions menu for a conversation. Add support to use iBeacons in Location Awareness. This allows for more fine grained control over locations as well as moving locations (e.g., in a car). Improve login process to prevent an issue with the application getting stuck in "Authenticating…" some users were experiencing. Correct a problem where the default location might become disabled when deleting other locations. Don't start monitoring for new locations if Location Awareness is turned off when creating them. Fix button placement for the in-line SMS reply on the iPhone X when the keyboard is not showing. Fix issue where the AppStore build for the previous version would not show the biometric authentication screen when the application is first launched and where the application-specific password could not be disabled. When looking at the list of contacts for a group message (by tapping the "Group Message" header in the conversation view), individual contacts can now be added to the iOS Address Book and contacts cards can be displayed for contacts already present in the Address Book. 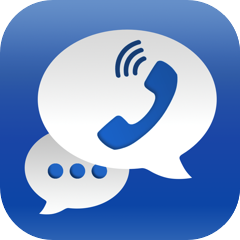 Tapping a phone number in a contact card for a conversation, voice mail, or call history item now allows to call or send a text message to that number. Improve handling of biometric authentication dialogs during phone calls. Fix corner case that could lead to the application passcode lock being disabled without user interaction in rare cases. Make sure that the phone number to call is properly populated when opening the application via URL scheme if it wasn't already active in the background. Various UI tweaks and stability improvements. Fix issue which could lead to a crash for group messages where some of the contacts had " (" in their name. Make sure that switching accounts via re-selecting the current view tab on the iPhone works immediately after adding a second account. Add "Tip Jar" In-App Purchase in order to allow showing your appreciation for the continued development and support for GV Connect – now already more than seven years! Various stability and performance tweaks. Various UI tweaks for iPhone X. Fix placement of conversation action menu in iOS 11.1. Misc stability improvements based on user submitted reports. Fix login failures for accounts that have 2-Factor Authentication enabled. Fix crash when saving a photo from the full screen preview to the photo library on iOS 11. 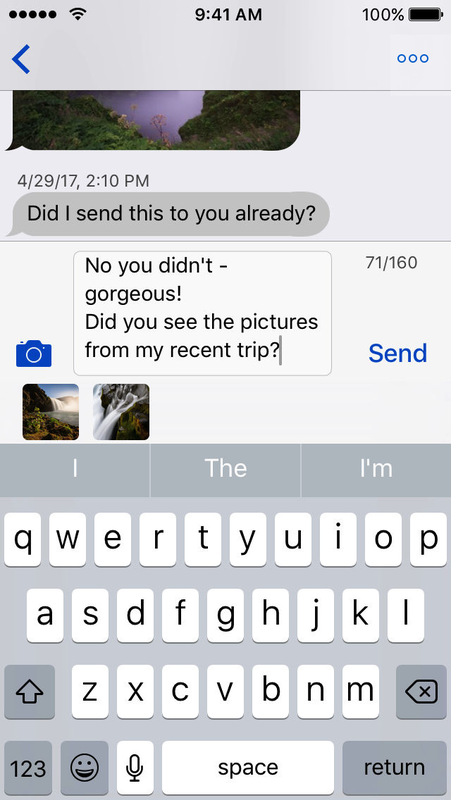 Correct minor UI issue when swiping to delete individual messages from a SMS/MMS conversation on iOS 11. Drag and drop on iOS 11: Add support for dragging images from MMS conversations or full-size image previews to other applications and dragging images from other apps to new picture messages or replies. Minor UI improvements when using iOS 11's "Smart Invert" feature. Updated application to fully support and embrace iOS 11 and the iPhone X. Improve handling of incoming MMS attachments that are not supported by Google Voice – they are now listed as "[Unsupported Attachment]" in the conversation view. 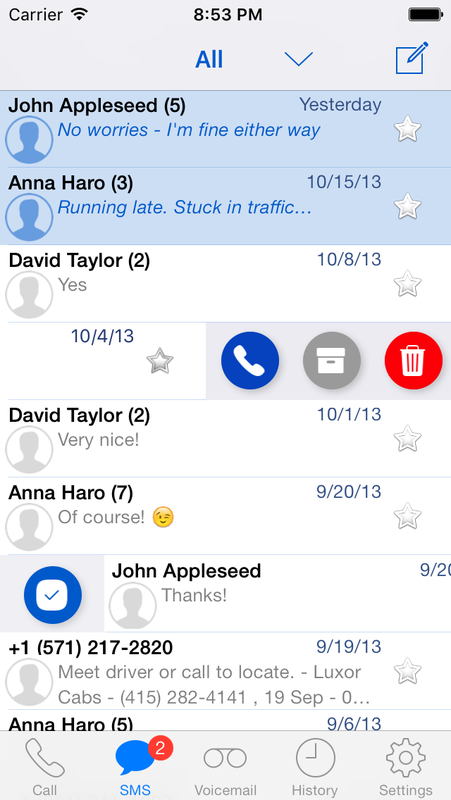 Support for native group messages and MMS (picture messages). MMS support requires purchase of a one-time In-App Purchase for activation. All SMS messages to/from a single phone number are now grouped into a single thread rather than broken up into arbitrary conversations. Older messages in a thread (if available) can be loaded using "pull to refresh" at the top of the list. Each message in an SMS conversation now has a full date & time stamp rather than just showing the time of day. 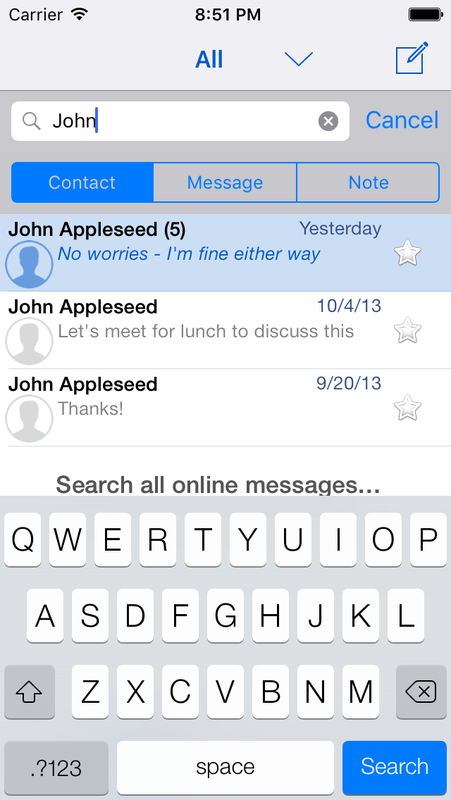 Added the ability to delete individual messages in an SMS conversation (using swipe-to-delete). Allow marking messages as (not) Spam independently of (un-)blocking phone numbers. Blocked numbers/contacts are now shown with a blocked icon in the message lists. Removed "Trash" entry in message lists and "Move to Trash" action for messages (this feature is no longer supported by Google Voice). "Delete" will now immediately and completely delete an item. Starred messages and conversation notes are now application-specific (with no syncing between devices) since Google removed those features as well. Massive speed increase when loading SMS conversations with a large number of individual messages. Optimized interface to the Google Voice servers to reduce the amount of data used. When replying to an incoming SMS directly from the notification without opening the application, the message will now be automatically marked as read. Update the protocol for verifying forwarding phones to the latest version so that it works again. NOTE: This version does not include any of the new features (MMS, group messaging) just introduced by Google yet. It is a quick release to restore functionality which broke due to the server-side changes. Support for the new features will be added in a future release. Fix login failures caused by the new Google Voice interface just introduced by Google. Fix potential crash when starting the application with the Settings view active if forwarding numbers have been added or removed from outside of the application. NOTE: Starting with this version, the minimum supported iOS version increases from iOS 8.0 to iOS 9.0 in order to be able to utilize new system features. Improve reliability of new message notifications when the device is locked (previously only the application badge would update reliably but the notification would not always appear). Update to use the latest iOS contacts framework. This fixes random issues with selecting phone numbers for unified contacts as well as some UI glitches related to contacts. Make the "Cancel Callback" button in the alert dialog after placing a call via callback actually cancel the callback again. Fix various UI issues when running on iPad in split screen (views incorrectly displayed as popovers instead of full split screen). Improve loading speed of Favorites list. Better handling of contact pictures for phone numbers that are attached to multiple contacts when only some of them have a contact picture. Fix issue where the application would ask for a 2-Factor code when it should have instead asked to verify the recovery email address. 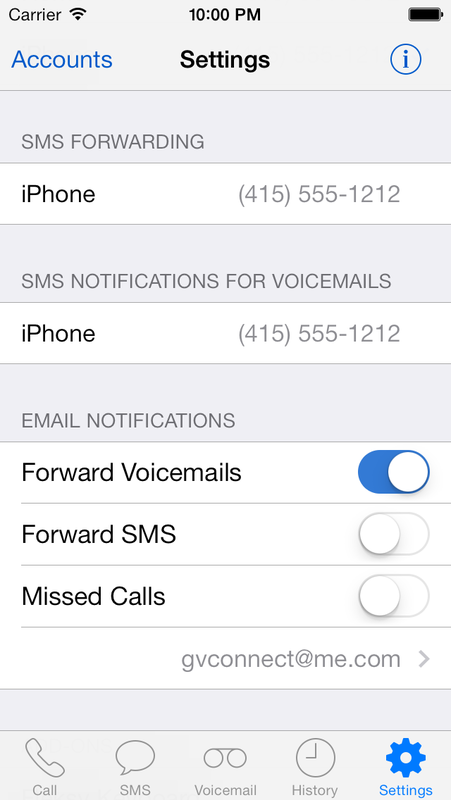 Resolve crash when trying to forward a SMS conversation or voicemail with an attached note as email. Add a slew of additional keyboard shortcuts when running on iPad (hold down the command key to see the list of shortcuts available in the current context). Fix various minor UI inconsistencies. Various other stability and speed improvements. Note: as of version 2.4 the minimum system requirement is iOS 8 - older system versions are no longer supported. Put the application on a diet, slimming down the application size considerably – you now have even more room for selfies available on your device! Fix login failures for accounts using 2-Factor Authentication. Fix for recent login failures. Improved compatibility for logins using 2-Factor authentication. This fixes the continuous loop during login that some users have been experiencing and avoids multiple prompts for the 2-Factor code entry. Re-wrote all authentication calls to account for Google closing down their ClientLogin interface without notice on 5/26/2014. Sorry for the unexpected downtime but we're sure that you will like this new version even better! Full support for 2-Factor authentication (you no longer need to create and use an application-specific password for GV Connect) - this includes re-adding the 'Direct Call' option for accounts using 2-Factor authentication (you should log in again with your account password and 2-Factor code instead of previously application-specific password to make direct calling work again). If you fill your account information using 1Password and have your authenticator set up in the application, the login will automatically submit your 2-Factor code from 1Password as well. Fix crash when trying to invoke 1Password from the login view. Add 'Reply' button to SMS notifications in iOS 8 or higher. Remove the 'Direct Call' option for accounts using an application-specific password since the two are not currently compatible with each other. On the iPad, dismiss the About view when showing the mail controller to compose a support email message. Update the protocol used to initiate a direct call to fix the error that started to appear recently due to a server-side change. Fix issue where displaying a person's contact details would sometimes show an empty person on iOS 8. On devices running iOS 8 or higher, show multiple swipe actions in the message list view (Call, Archive/Move to Inbox, Delete) rather than having a preference setting for the action to be shown as on earlier versions of iOS. Add additional application settings (Auto Refresh, Message Sounds, VM Prefetch) to settings that can be managed via QuickSetting. You need to re-create/re-add your existing QuickSettings to add managing of those additional settings. Fix login issue when using TouchID if the device is already unlocked via TouchID at startup before the TouchID dialog was shown. Fleksy Keyboard integration (available as In-App purchase, requires iOS 7) - Fleksy Keyboard lets you type without having to look at your screen. You can miss every letter and Fleksy will still figure out exactly what you meant to type. Enable Fleksy Keyboard to make GV Connect the fastest texting solution available! Improve reliability and error reporting when using "Direct Call"
Add support for specifying an expiration date/time for "do not disturb"
Corrected issue where some users (mostly non-US based) would not be able to log into their account but get stuck in Logging in…/Loading Settings… forever. Fixed intermediate crashing on composing a new SMS after selecting a contact's phone number from the AddressBook. Display correct location and local time for US-based numbers within the 307 area code. Added new logout confirmation dialog to avoid accidental logout. 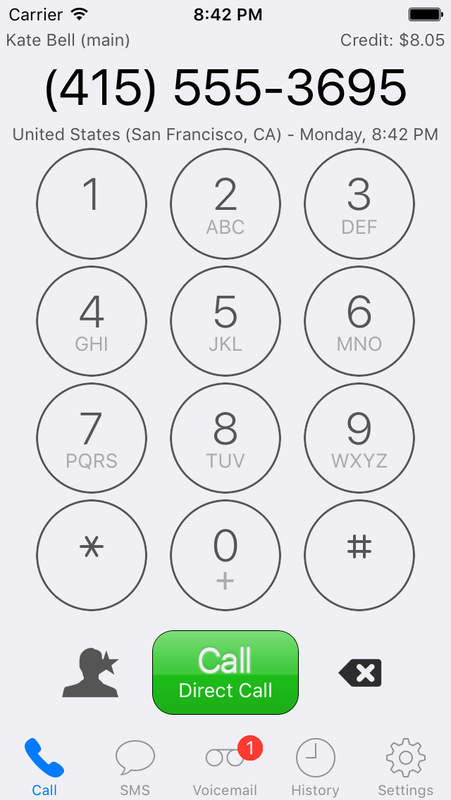 Clear the last dialed number from the dial pad display when relaunching the application from background. Improved the URL scheme to allow ABContacts integration. Better handling of changing network accessibility to improve automatic fallback to the offline dialing feature. GV Connect respects and guards your privacy — no device information of any kind (device type, system version, unique device identifier, …) is ever sent to any server for tracking or other purposes without your knowledge. Your Google Voice account password is stored securely encrypted in your device's Keychain and cannot be accessed by other applications or retrieved from a device backup on your computer. No personally identifiable information or (e.g., account username) or message data is ever passed through any third-party servers - the application communicates exclusively with the Google Voice servers maintained by Google. Google Voice is a trademark owned by Google, Inc. — GV Connect is not affiliated with or endorsed by Google or Google Voice. Changes on the Google Voice website might disrupt the application — if this happens, I will try to update the application as quickly as possible to restore its functionality.